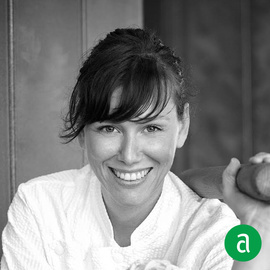 Erin Clarke, Executive Chef at Casa Luca in Washington, D.C., shares her career timeline and advice for up-and-coming talent. I knew since I was a child that I wanted to cook. I did what I could to travel, experience different cultures through food and study abroad. As a young cook, you should learn the basics, and you should spend time working in fine dining establishments to learn classic technique. As you progress in your career and move into a supervisory role, you need to develop good team building and management skills. It serves you well to be empathetic to those around you, to put yourself in others’ shoes. Everyone must work toward a common goal, and multitasking is a must. “Excuses are for the weak.” While it seems severe, this motto has gotten me through some tough situations. It holds me very accountable. There are so many situations that affect you, but if you just dig in deep and do it, you’ll find that everyone rallies around and helps you through it. I have an ongoing dialogue with my team. We are all very close in the context of Casa Luca. Our conversations and dialogue are really about the food and the menu. I always ask for their input. It’s so important to build a strong culture. I need to be able to trust the staff when I’m not there, and feel confident that they are implementing my creative algorithm. My team is a huge assistance to me; they support the details of plating and recommending new flavors which gets them excited about the new menus we develop together. The two things I cannot do my job without are my Birkenstocks and Korin Knives! All of my jobs have had an impact on my career. Working in France at Arpège was amazing experience early on in my career. Working with Fabio has been the most impactful experience I’ve ever had. We think similarly about food. We have the same idea about hospitality and the guest experience. It’s hard to find someone in the industry that wants to foster you and help you grow. There’s always something new that I’m able to discover with him. He will always be a mentor to me.